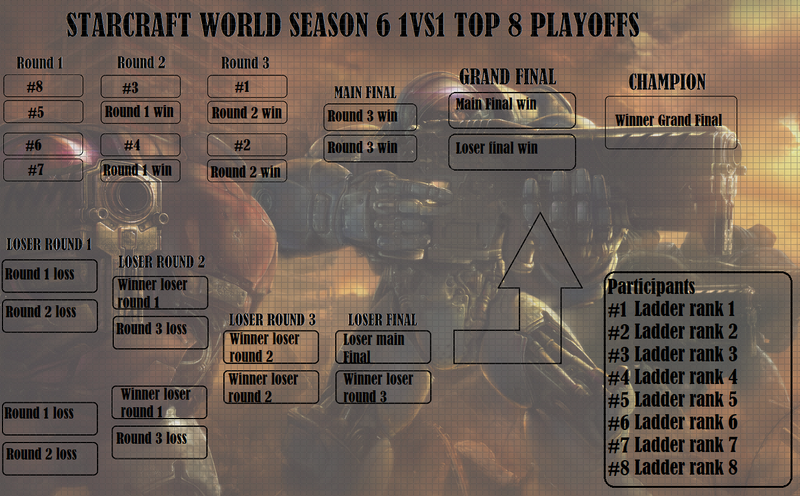 Welcome to the "official SCW season 6 Playoffs thread". Season ends July 29, 23:59:59/11:59:59 PM website time(GMT-4). Playoffs officially start August 3 at 2:00 PM/14:00 Website time(GMT-4). Players can play their matches before this date if their opponent is online. The playoffs start officially on August 3 because of the different time zones players are in. Top 8 ranks are seeded in playoffs. Playoffs Bracket. Click "here" for Example with info. All matches are RANDOM vs RANDOM, unless both players agree it is oke to pick. Leaving at the start, unless it can be proven your opponent picked a race without an agreement, or started while you were "away from keyboard", will results in a loss. Disconnecting will result in a loss, unless it can be proven in the replay that you were winning up until the point of disconnection. Players are to provide evidence or a witness that their enemy disconnected. Make a screenshot of your opponent disconnecting. NO HARD BM ON THE PLAYOFF THREADS. SOFT BM IS ALLOWED. Report and upload matches in the report thread. Please use this thread to let other players know when you are online and when you can be online. Please plan your matches together with the other players. Special thanks to donators: Momo85, Live.SwOrD, PreMier, and Anonymous donator. We decided to post this thread early so everyone knows what to expect for the playoffs well before it happens. Why not just no Mind Control on workers? So if this happens the game is over? And that player who got their worker stolen wins? Yes, breaking this rule is equivalent to a forfeit. if you scan your opponent having terran buildings you can immediately leave and report the game. oops, I meant to write that "on workers" bit but forgot. thanks! It actual takes minimal effort to block a base in with cans temps reavers. 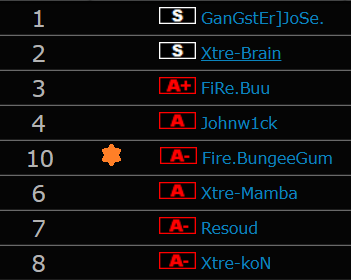 P is the by far the easiest and most overpowered race on a fastest map. Really doesn't take that much skill to obtain map control.. lol but everyone knows this. Your just trying to sound like you have skill in this game.. where you and everyone knows if you played a full season as random you would have 50% win ratio. Next rule will be “no probe glitch recalls” I bet. Noobs (no offence but it’s true) making rules about what way you can use units is just crazy and is eventually gonna ruin the game. FYI mind control on workers is banned in most pro play.